The present study was designed to investigate the antidiarrhoeal potential of 50% ethanolic extract of Cinnamomum tamala on experimentally induced castor oil diarrhoea, gastric emptying of phenol red meal, gastrointestinal transit of charcoal meal and in vitro mast cell degranulation activity. 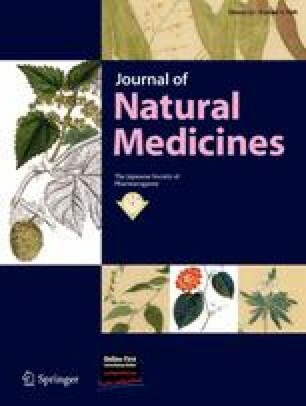 C. tamala extract (25, 50 and 100 mg/kg, orally) produced a dose-dependent reduction in the total amount of faecal matter in castor oil-induced diarrhoea. The mean distance travelled by charcoal meal at 50 and 100 mg/kg of extract showed a significant reduction in the secretion of gastrointestinal fluid accumulation by 32.5–65.0%. The Na+ and K+ concentrations on castor oil-induced fluid accumulation showed a greater inhibitory effect on Na+ levels than on K+ concentrations. C. tamala significantly reduced the lipid peroxidation (P < 0.001) and increased the catalase (P < 0.01) activity in comparison to the castor oil-induced groups. C. tamala leaf extract did not show any significant effect at a higher dose (15 mg/ml) on mast cell degranulation. However, the extract in the dose of 5 and 10 mg/ml conferred significant mast cell protective action (P < 0.001). The percentage of eugenol in extract is 3.8% w/w, and total tannin is 247.5 mg/g. The result indicates the Indian spice C. tamala is useful for diarrhoea. This study was supported by grants from the Department of Science and Technology, Ministry of Science and Technology, New Delhi. Authors are highly thankful to Dr. M. P. Dubey, Retired Scientist and Head, Department of Pharmacology, Central Drug Research Institute, Lucknow, India, for his critical advice during the course of study. Authors are also thankful to the Director of NBRI for providing necessary facilities.